Duodenal mucosa is typical of the small intestine. 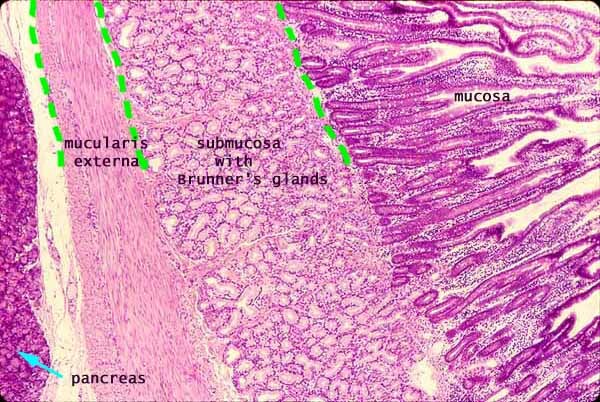 The duodenum is distinguished from other regions of the small intestine by the presence of submucosal Brunner's glands. These mucous glands pack the submucosa so completely that the typical submucosal connective tissue is obscured. Muscularis externa of the duodenum has the standard inner circular and outer longitudinal layers of smooth muscle. The pancreas lies near the duodenum and may appear in some of our non-human specimens (particularly on the slide labelled "Small Intestine, Three Regions").